Canada is the source of minerals as common and plain as asbestos to extremely valuable diamonds. 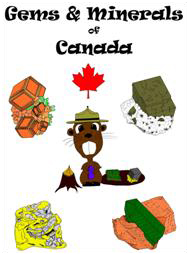 This 32-page resource showcases Canada’s mineral heritage with information about its minerals, mines and mining history. The book includes carefully drawn mineral specimen pictures, text, and games to reinforce the information presented throughout the book.